Gads! Although I'd regret it later, I could easily devour that entire plate (along with some fresh buttermilk on the side, perhaps)! 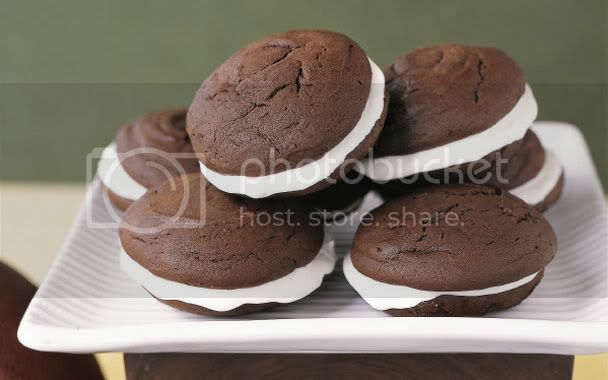 Although the chocolate original is still king in my book, every variation on that original whoopie pie will be available for purchase and sampling on the 18th -- from pumpkin to spice to red velvet. Wow, yeah. They do look delicious, dangerously so! What could be better . . . an honest-to-goodness lobster roll followed by a Whoopie Pie!! The combo sounds worthwhile. And while this shop is on its way to becoming an institution, the two rolls we've tried there were less than great. The problem we had was with the toughness of the lobster. When compared to the product put out by Luke's Lobster, Redhook's is chewy and dry. At first I thought this could be a matter of wild caught versus farm raised product. Both places, however, claim to use wild caught lobsters of around the same size, claims backed by the fact that neither shop's product was more flavorful (wild seafood has a stronger taste.) Besides, lobster prices have been so low lately that there isn't much of a price incentive to go with farm raised product in an era obsessed with "natural" food. As for the Whoopie: I was expecting the filling to be made in-house. It's not. And while I liked the filling because it was less sweet than most, I wouldn't say that either the filling or the pie are particularly noteworthy. So unless you have a strong lobster craving while at the Red Hook cruiseliner terminals down the block, I'd skip this place. Besides, Luke's two shops are on Manhattan and so are far easier to get to for most visitors and commuting locals. A Manhattan food concern wins a comparo -- who would've thought?